In this chapter, we present an abridged version4.1 of the performance model for X10 v2.3.1 focusing on those aspects that are most relevant for the HPC programmer. Although the rate of change of the X10 language has significantly decreased from earlier stages of the project, the language specification and its implementations are still evolving more rapidly than production languages such as C++ and Java. Therefore, we break this chapter into two logical sections: aspects that we believe are fundamental to the language itself and aspects that are more closely tied to specific choices embodied in the X10 v2.3.1 implementation and thus more likely to change in future versions. The second logical section is presented simultaneously with a discussion of some of the central implementation decisions embodied in the X10 v2.3.1 runtime system and compiler. 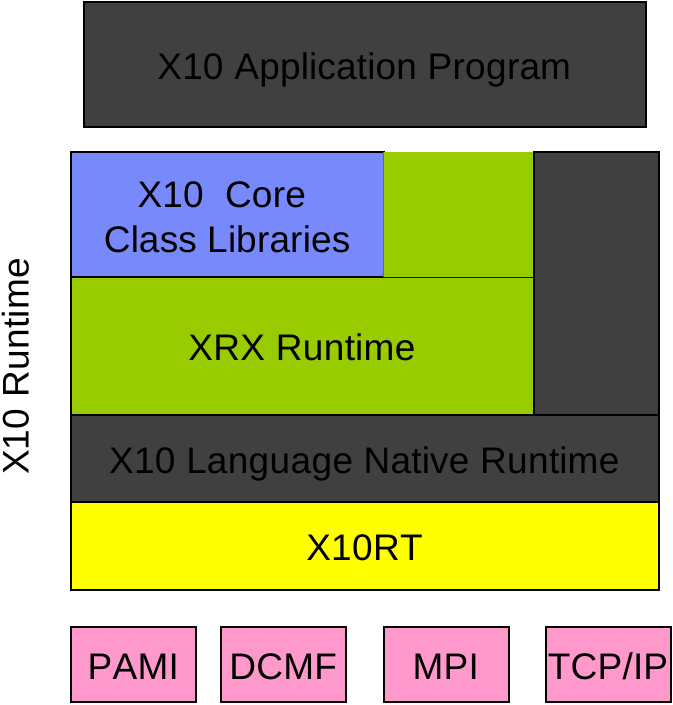 The X10 standard library provides the GlobalRef, RemoteArray and RemoteIndexedMemoryChunk types as the primitive mechanisms for communicating object references across places. Because of a strong requirement for type safety, the implementation must ensure that once an object has been encapsulated in one of these types and sent to a remote place via an at, the object will be available if the remote place ever attempts to spawn an activity to return to the object's home place and access it. For the performance model, this implies that cross-place object references should be managed carefully as they have the potential for creating long-lived objects. Even in the presence of a sophisticated distributed garbage collector  4.3, the programmer should expect that collection of cross-place references may take a significant amount of time and incur communication costs and other overheads. X10 v2.3.1 is implemented via source-to-source compilation to another language, which is then compiled and executed using existing platform-specific tools. The rationale for this implementation strategy is that it allows us to achieve critical portability, performance, and interoperability objectives. More concretely, X10 v2.3.1 can be either compiled to C++ or Java. The resulting C++ or Java program is then compiled by either a platform C++ compiler to produce an executable or compiled to class files and then executed on a cluster of JVMs. 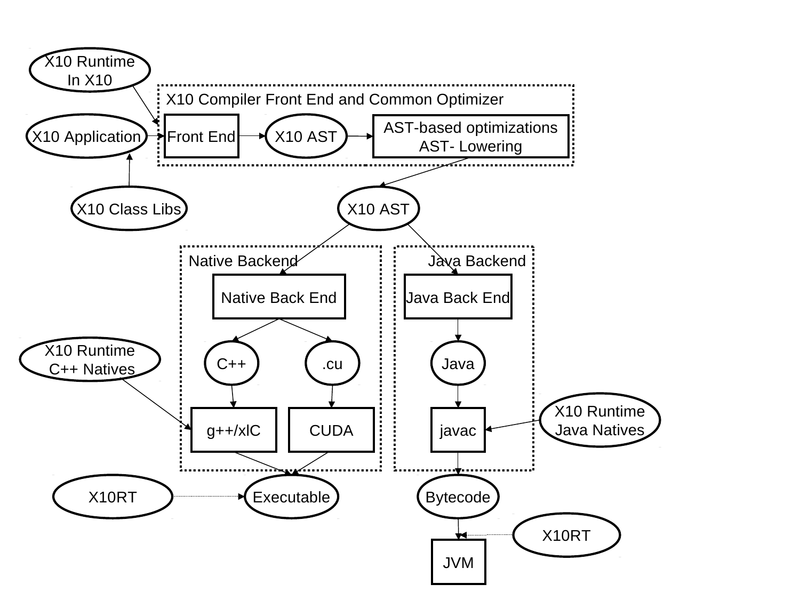 We term these two implementation paths Native X10 and Managed X10 respectively. The runtime also provides a set of core class libraries that provide fundamental data types, basic collections, and key APIs for concurrency and distribution such as x10.util.Team for multi-point communication or x10.array.Array.asyncCopy for large data transfers. In this section, we review the specifics of the X10 v2.3.1 runtime implementation focusing on performance aspects. The X10 v2.3.1 runtime maps each place in the application to one process.4.4 Each process runs the exact same executable (binary or bytecode). Static fields are lazily initialized in each place when they are first accessed. Both X10 v2.3.1 backend compilers map static fields initialized with compile time constants to static fields of the target language. Other static fields are mapped to method calls. The method checks to see if the field has already been initialized in the current place, evaluates the initialization expression if it has not, and then returns the value of the field. Therefore accessing a static field with a non-trivial initialization expression will be more modestly more expensive in X10 than the corresponding operations in either C++ or Java. The X10 v2.3.1 distribution comes with a series of pluggable libraries for inter-process communication referred to as X10RT libraries [11,12]. The default X10RT library--sockets--relies on POSIX TCP/IP connections. The standalone implementation supports SMPs via shared memory communication. The mpi implementation maps X10RT APIs to MPI . Other implementations support various IBM transport protocols (DCMF, PAMI). Each X10RT library has its own performance profile--latency, throughput, etc. For instance, the X10 v2.3.1 standalone library is significantly faster than the sockets library used on a single host. The at construct only permits point-to-point messaging. The X10 v2.3.1 runtime provides the x10.util.Team API for efficient multi-point communication. The X10 v2.3.1 tool chain implements at constructs via serialization. The captured environment gets encoded before transmission and is decoded afterwards. Although such an encoding is required to correctly transfer object graphs with aliasing, it has unnecessary overhead when transmitting immediate data, such as arrays of primitives. The X10 v2.3.1 scheduler assumes a symmetrical, fixed number of concurrent execution units (CPU cores) per process for the duration of the execution. This assumption is consistent with the HPCS context--job controllers typically assign concurrently running applications to static partitions of the available computing resources--but will be relaxed in subsequent releases of X10 . The X10 v2.3.1 scheduler belongs to the family of work-stealing schedulers [2,3] with a help-first scheduling policy . It uses a pool of worker threads to execute activities. Each worker thread owns a double-ended queue of pending activities. A worker pushes one activity for each async construct it encounters. When a worker completes one activity, it pops the next activity to run from its deque. If the deque is empty, the worker attempts to steal a pending activity from the deque of a randomly selected worker. In X10 v2.3.1 , the thief initially chooses a victim at random then inspects the deque of every worker in a cyclic manner until it manages to steal a pending activity. Suspended and stopped workers are idle. Starting in X10 v2.3.1 , the runtime will mostly suspend excess idle workers, but even if the place is entirely inactive the runtime still requires one worker to be polling the network (i.e., busy waiting) to respond to incoming messages. We expect that at least for some x10rt implementations that in later X10 release it will be possible to eliminate the need for busy waiting entirely. The X10 v2.3.1 scheduler never preempts a worker running user code. The X10 v2.3.1 runtime is designed to enable achieving the highest possible performance on MPI-like distributed X10 applications where the programmer use matching send and receive instructions to achieve total control over the communication and execution schedule. If the user code never yields to the runtime then pending activities (local or remote) are not processed. In other words, the runtime does not make any fairness guarantee. The user can specify the number of workers in the pool in each place using the X10_NTHREADS environment variable.4.6 The X10 v2.3.1 scheduler may create additional threads during the execution. But it strives to maintain the number of non-idle workers close to the requested value. In order to minimize pool size adjustments, the scheduler implements one key optimization. If a worker blocks on a finish construct but its deque is not empty, it does not suspend but instead processes the pending activities from its deque. It only eventually suspends if its deque becomes empty or if it reaches some other blocking construct (different from finish). By design, the pending activities that get processed by the worker in this phase must have been spawned from the blocked finish body. In the X10 v2.3.1 implementation, the worker will not attempt to steal activities from others if the finish construct is still waiting for spawned activities to terminate when the deque gets empty as this would require to carefully pick activities the finish construct is waiting for. Within a place, one only needs to count activity creation and termination events to decide the completion of a finish construct. The story is different across places as inter-process communication channels are likely to reorder messages so that termination events may be observed ahead of the corresponding creation events. The X10 v2.3.1 implementation of finish keeps track of these events on an unambiguous, per-place basis. In practice however much fewer counters, fewer messages, and smaller messages are necessary thanks to various optimizations embedded in the X10 v2.3.1 implementation. In particular, events are accumulated locally and only transmitted to the finish place when local quiescence is detected--all local activities for this finish have completed. Counters are allocated lazily. Messages use sparse encodings. The X10 v2.3.1 implementation of the atomic construct uses a place-wide lock. The lock is acquired for the duration of the atomic section. The when construct is implemented using the same lock. Moreover, every suspended when statement is notified on every exit from an atomic section, irrespective of condition. Because the X10 v2.3.1 implementation does not include a distributed garbage collector, if a GlobalRef to an object is sent to a remote place, then the object (and therefore all objects that it transitively refers to) become uncollectable. The life-time of all multi-place storage must currently be explicitly managed by the programmer. This is an area of the implementation that needs further investigation to determine what mix of automatic distributed garbage collection and additional runtime interfaces for explicit storage control will result in the best balance of productivity and performance while still maintaining memory safety. Clearly, the performance models described in this chapter are not the final and definitive X10 performance model. However, we do believe that the language specification and its implementations are well-enough understood that it is possible for significant X10 programs to be written and for programmers to obtain predictable and understandable performance behavior from those programs. As the X10 implementations continue to mature, we expect to be able to eliminate some of the less desirable features of the X10 v2.3.1 performance models. The X10 v2.3.1 runtime may launch additional processes to monitor the application processes. These helper processes are idle most of the time.